Go ahead! Take a look. Imagine the possibilities! with complete instructions to go with these NEW Home Décor stencils. 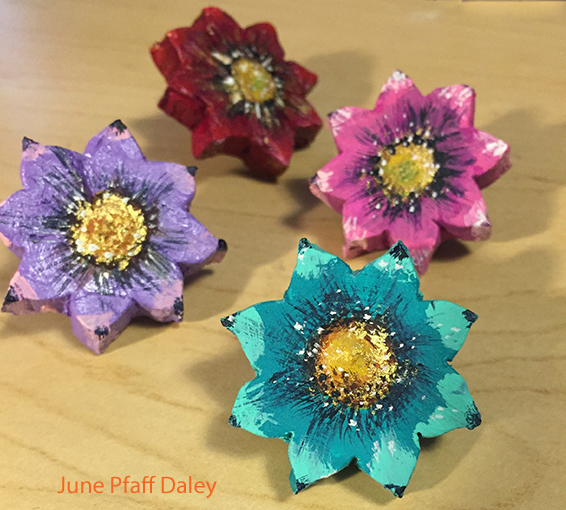 June Pfaff Daley is a mixed media artist who creates with everything from wood to fabric. She enjoys transforming thrift store treasures and favors whimsical motifs. June resides in Cincinnati, Ohio with three fantastic kids, one supportive husband, a darling dog and a charming cat. Visit her website: http://www.junepfaffdaley.com. 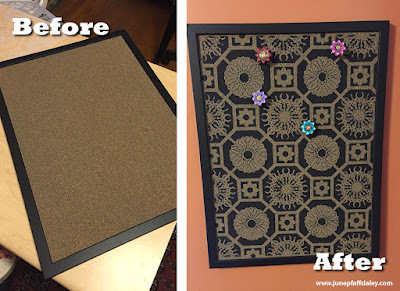 I picked up that plain ‘before’ cork board at a thrift store awhile back for the bargain price of 50 cents. (Side note: In my opinion this is the only way to shop for cork boards. I see them ALL the time at thrift stores looking all brand new and lonely.) I knew this board was in for a makeover the second I found a free moment. 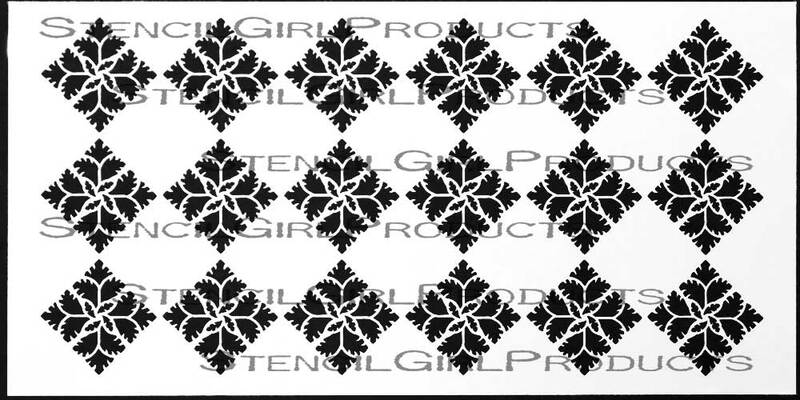 Well that free moment finally came when the mail lady delivered a tube containing (wait for it…) Stencil Girl’s new line of HOME DÉCOR STENCILS! As I opened the tube and unfurled the gigantic 12” x 24” gorgeously designed piece of stenciliousness my heart skipped a beat. Nothing in my home was safe from pattern now. With this new product I knew my sad, boring cork board would be transformed in a matter of minutes. 1) As luck would have it my cork board was the same length as the stencil. I used a bit of masking tape to hold it in place and stenciled black acrylic paint with a larger paintbrush. Cork is a dream to stencil on as it absorbs any extra paint and produces nice crisp lines even if you oversaturate your brush which I admit I am often guilty of in my enthusiasm to stencil quickly. The size of the project does no matter. 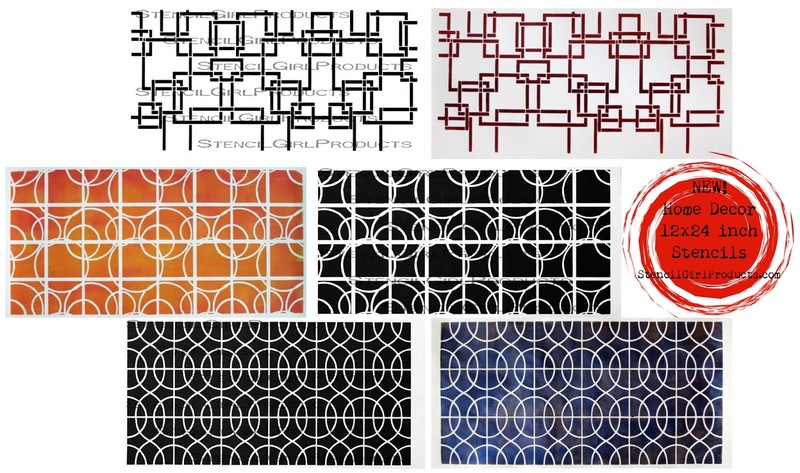 These stencils are designed for a pattern repeat. Just line up where you left off and finish the area that needs covered. After my board was complete I started in on creating pushpins. 2) Roll a piece of paper clay out to ¼” thickness. Place the 9” x 12” stencil on top. Using an xacto knife cut around the edge of the pushpin flower design. Be very careful not to cut the stencil! I did try to outline in pencil first however I found I got a much crispier design when I just went in with the knife. Take your time and all will be well. 3) After I cut out four flowers, I cut an indentation in the back of each in which to put the pushpin snug-as-a-bug in the center of the paper clay flower. In the center I placed a dab of E6000 and inserted the pushpin. Now you could definitely use a pushpin without a decorative ball. However, I like to utilize what I already have on hand whenever possible. My craft room does not need more purchases of any kind! 4) Using a bit more paper clay cover the ball of the push pin. Let flowers dry. After the flowers are dry, sand the paper clay to make the push pins all perfecto. 5) Finally, paint the flowers as you please. 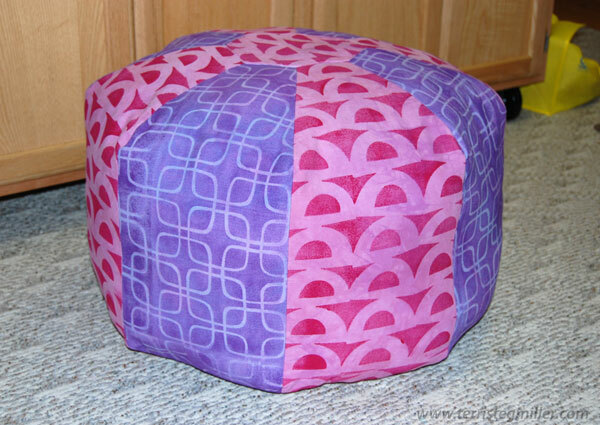 Terri can hardly wait for her granddaughter to try out the new pouf she made! Step 1: Gather supplies: I started with two colors of cotton duck fabric (you can find several color choices at your local fabric store). I chose Amy Butler's Gum Drop Pillow pattern and two stencil designs. Step 2: Using textile paint, a foam roller, and a foam plate as my paint palette, I added the stencil designs to the cotton duck fabric. I like to tape around the edges of my stencils with duct tape to create a wide frame, this gives me added cushion so I don't roll over the edge of the stencil. Step 3: Holding the stencil down firmly on one edge with my hand, I roll the foam roller away from my hand. I roll only in one direction. I find if I roll in more than one direction, the stencil is more likely to shift. 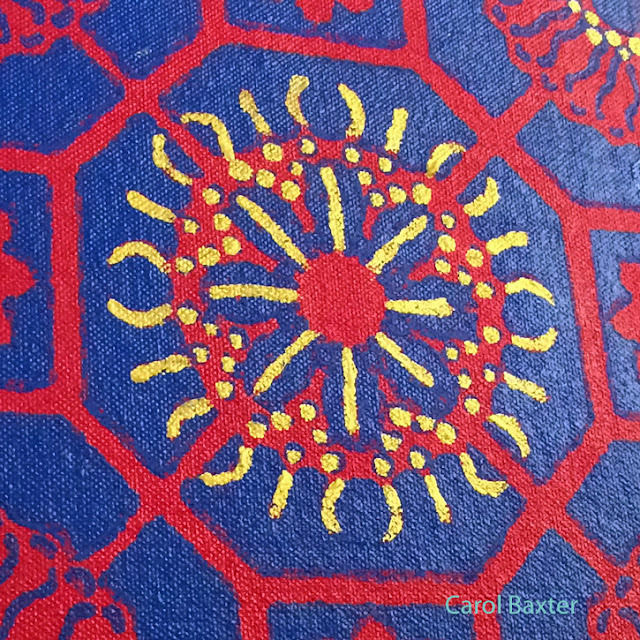 Step 4: After my fabric was covered with the stenciled design, I let it dry completely, overnight is best. Heat set the fabric with an iron, following the directions on the textile paint packaging. Step 5: Following the pattern directions, I cut out the fabric pieces and sewed them together. I stuffed the pillow with fiber fill. Final Pillow: The pillow could actually use more stuffing. I bought a large bag of fiber fill and used the entire bag. The firmness of the pillow can be adjusted to your liking. 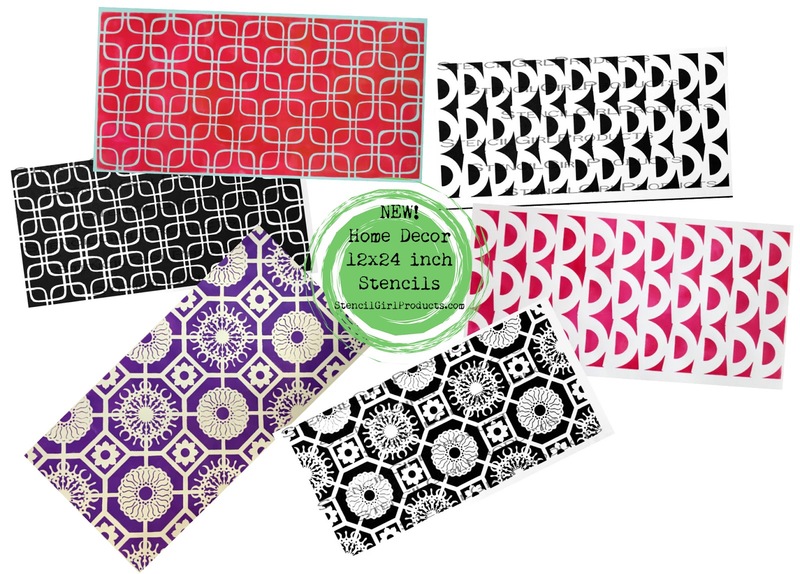 The possibilities are endless with creating your own stenciled home decor fabrics. Armed with fabrics, stencils, and sewing patterns, you can customize your decor in so many ways. Carol Jean Baxter is primarily a writer and is delighted to be a part of the StencilGirl Creative Team. Never be afraid to try something new! 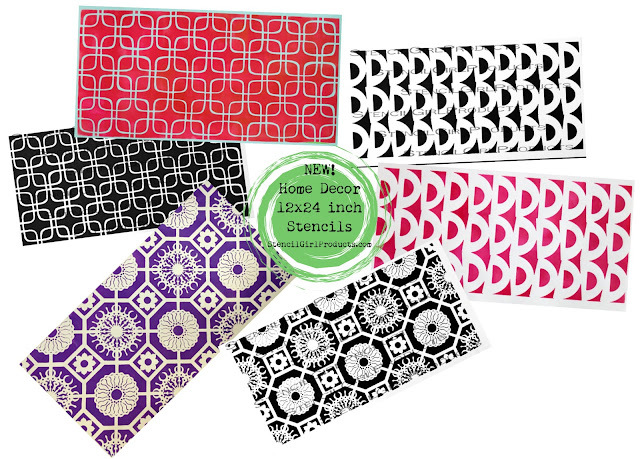 Stenciling is easy and fun! A book on how to paint floor cloths has sat dusty upon my shelf for years. When Mary Beth announced she was launching a line of home décor stencils OPPORTUNITY frantically waved my bucket list in front of my face. Bucket ‘o water for washing your trays, rollers, and brushes. 1. Draw out your design and then make a pattern. Newbie perspective: I had a project in my head and when I mapped it out on paper, I realized it would need to be much larger, mean more masking, wait-for-it-to dry time and lining-up-of-edges, than I was ready to tackle as an impatient person and a relative newbie to using stencils. 2. Modify pattern if necessary. I wanted to preserve the floral tile pattern of G001 Antique Tiles in my floor cloth but be able to make straight cuts to the floor cloth when I finished. 3. Iron the canvas. Cut canvas a few inches bigger around than your pattern. Tape canvas tightly to your work surface. I went from edge to opposite edge. 4. Roll on a foundation layer of white paint and let dry. Newbie tip: I panicked a bit when I noticed the unpainted canvas edged rippling and popping up the masking tape. This is caused by the paint soaking into the canvas fibers. I added a couple more layers and this was no longer an issue. 5. Roll on a layer of red paint and let dry. You will notice the cloth absorbed less paint and is getting smoother but it is NOT totally smooth. 6. Place your stencil and mask it down. 7. Roll on the blue layer. Let dry. 8. Remove stencil. Celebrate success with happy dance! 9. Flip stencil, align to painted pattern and mask it down. 10. Roll on the rest of the pattern in blue. Let dry. Remove. 11. Highlight elements with metallic paint. These painted details will make it pop! Let dry. I admit, I danced another happy dance around my project t this point. 12. Paint on layer of varnish. Let dry. 14. Optional: Give your beautiful floor cloth a non-slip back by doodling silicone flowers on the back. Be certain silicone is completely dry before placing cloth on floor. Or you can simply place a non-stick rug lattice underneath. Note: Sew the edges of the canvas if you plan to make a large floor cloth. Was my cloth a tad imperfect? Sure, but I want to play with more fabric and these stencils. If you can't find me this summer I'll be in my garage using stencils on a floor cloth. More? We hear you asking for more! Here are Leaf Diamond G007 and Triangles G005 designed by Mary Beth Shaw. That makes 12 NEW Home Décor releases in February 2016! 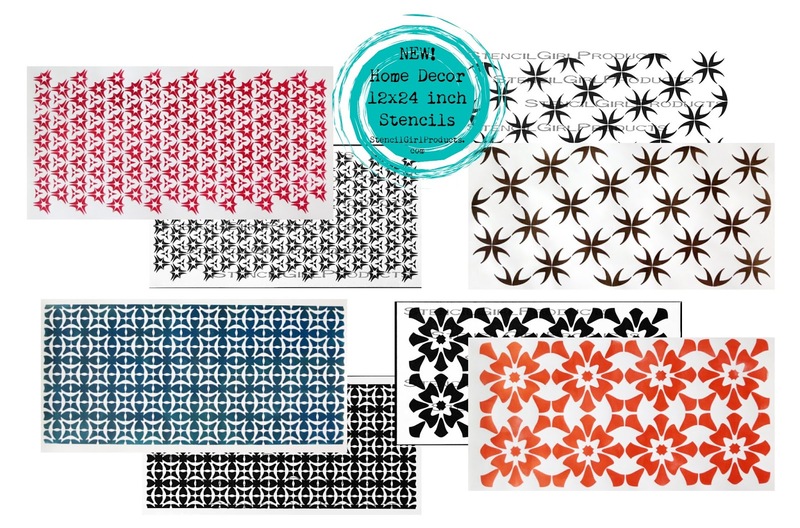 StencilGirl has some extremely talented artists designing more Home Décor stencils that we will continue to roll out. 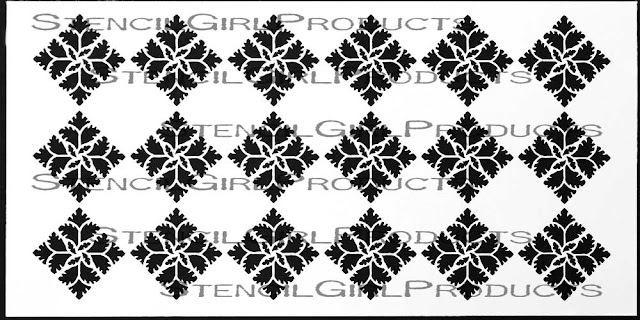 If you already receive The Scoop each month, we'll let you know when the next 12x24 inch stencils roll out. Need to get on the list for all our latest news? Sign up HERE. How will you dress up your home? I'm SO glad to see Stencil Girl now taking a rightful place in the home décor world!!! A brilliant idea, showcased in gorgeous artwork -- bravo, bravo, bravo!!! Very different n interesting ways to use Stencils ! Loved the pattern and what a huge size ! Fantastic! I have used stencils in my home decor, and love the way the results look. Thanks, Carol, for the floor cloth tutorial! Carol- it was so much fun and my husband was so patient as I completely took over the kitchen counter.